I haven't yet had a giveaway that I personally sponsor. I'm starting small by giving away these awesome signed bookmarks that I have! If this giveaway is a success, then I'm going to follow through with my plans to host a really big giveaway with YA realistic fiction novels and Adult urban fantasy novels (that one will be open for international followers, so hold tight!). How does that sound? Awesome? Well, then, spread the word!! If I hit 100 GFC followers,then for every 20 GFC followers I gain, I'll throw in a set of Ami Blackwelder bookmarks for 1 winner, until all three sets are claimed. So there's a possibility of 5 TOTAL WINNERS! Must be a resident of the US. Must be 13 or older or have a parent's permission. Must be a Lovey Dovey Books GFC follower or 'like' Lovey Dovey Books on Facebook. 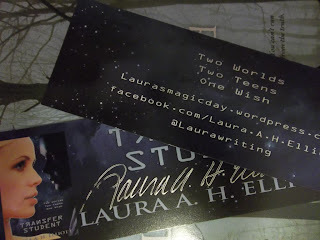 Signed bookmarks are a great giveaway! I'm a GFC follower now, and I hope you don't mind but I posted the link to my facebook page. I hope your readership increases as a result of this promotion. A give away seems to be a great way to get readers involved! I love bookmarks,I think it is a great giveaway.